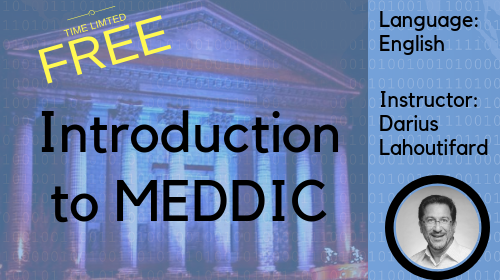 ---> Free for a limited time: An introduction to MEDDIC, one of the most renowned Sales Methodologies for high end Enterprise sales. We go through the definition of each element and how MEDDIC is used to increase sales, shorten sales cycle and more.. Non-financial reps learn how to leverage the value of a product/service to shorten the sales cycle, justify the price, avoid discounts and create a sense of urgency and a compelling event --> "When you don't buy my product, you lose money each day". Learn how to handle any objection when selling a product or service. This course is not just for enterprise or high tech sales. It can be used in any type of sales. In a 7 steps process, transform objections into sales. This course, not part of the original MEDDIC, is an additional course which focuses exclusively on building champions. It is included in the MEDDIC bundle, but those who know MEDDIC are not obliged to buy the whole bundle to enroll to this one.